School children were joined by Olympic swimming heroes at Bristol South Pool to celebrate the Big School Swim. Children from over 160 schools across the country took to the water last month to celebrate 125 years of school swimming. Swimming galas, water safety sessions and swimming lessons were just some of the events hosted as part of the Big School Swim. A special swimming lesson was held at Bristol South Pool, where 60 pupils from Ashton Gate Primary and Hotwells Primary were joined by Olympic heroes Rebecca Adlington, Cassie Patten, James Goddard, Craig Figes and Adele Carlsen to take part in a range of activities. Hosted by Olympic bronze medallist and swimming champion Steve Parry, the pupils experienced how swimming lessons have changed throughout the years with a look at how swimming was taught 1890s style. 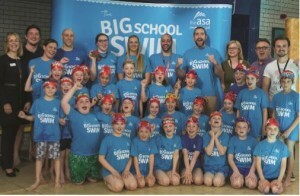 Jon Glenn, Head of Learn to Swim at the ASA, said: “Swimming has been taught in schools since 1890 and while the methods may have changed, the message that every child should have the opportunity to learn how to swim and know how to be safe in and around water, remains as strong as ever.